Trustee Responds to Charge of Being Willfully Blind or Incompetent! The organization in which Andrew Purkis served as a trustee had been dissolved. Purkis and his colleagues were cited as “…willfully blind or incompetent.” * Such strongly negative pronouncements inspired him to write an essay in which he listed four reasons why his British group had been unsuccessful in exercising their oversight responsibilities. A review of his rationale provides some fodder for American nonprofit directors/trustees to consider the reasons that led to his organization’s downfall– and more importantly, to assess their own board strengths and vulnerabilities. The following, in my opinion, are areas that have relevance to the Purkis exposition. An in-depth assessment takes time, interest and creativity. It will involve reviewing financials monthly, reviewing internal publications, following key sites on social media and being well prepared for meetings. 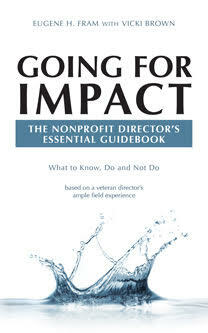 American nonprofit directors and trustees, in my view, are not willing to spend the time to accomplish. Rarely, for example, does one find any director/trustee interested in interacting with key staff people below the C-Suite level. Also rarely will director/trustee vote “no” on an issue that has majority support. Purkis acknowledges, for example, that management has responsibility for messages to various stakeholders and the board must delegate responsibility to management. In this instance, he acknowledges that the board needs to make certain that the right policies and practices are in place to avoid disseminating errant messages that could taint or destroy the organization’s reputation. Crossing the borderline can involve two routes:–(1)the board micromanages some or many operations; (2)the CEO takes actions on a board related issues without board permission. In the first instance, the CEO has to be emotionally secure enough to diplomatically confront the board on the action. Otherwise it will quickly be embedded in the culture. In the second instance, the board chair needs to point out the error to the CEO. If the error is not material, it can serve as an educational guide to future relationships. If a significant borderline error, or the CEO has repeated small errors, the board needs to determine whether or not a new CEO is required. discussions about their risk profile. None I have encountered has even designated an organization spokesperson in the event of a common casualty losses, like a flood or fire, let alone what might be a response if electronic medical records are stolen and then publicized by the criminals. Andrew Purkis’ response has provided a platform for discussion on both sides of the Atlantic. The borderline and fundraising concerns are decades old and should have been put to rest in practice by now. But they require strong assessment practices and viable fundraising partnerships to become board norms. There is no question that the need for risk assessment has been escalated, and boards in Britain and America need to step-up to the plate to be prepared for change.